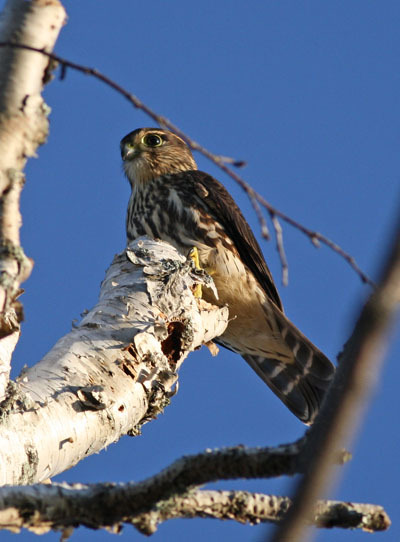 Early this morning a Merlin showed up in the yard. I thought the Merlin was eating something when I was photographing her, but after I downloaded the photos, I saw what looked like a “pellet” in the Merlin’s mouth. 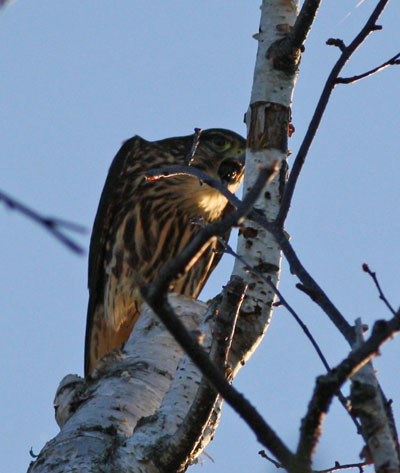 I think the Merlin might be a female or an immature as the male has a slate blue back and this bird was quite brown. Then, the pellet came flying through the air! Per Birds of North America On Line, pellets typically cast daily (early morning) representing feather and skeletal remains from previous day. I imagine she feels a lot better after expelling that big hunk of waste from her crop. Okay, now onto the next bird, and with that she took off after one of the Hairy Woodpeckers that frequent the peanut feeders in the yard. Yipes! This is such a neat series of photos! 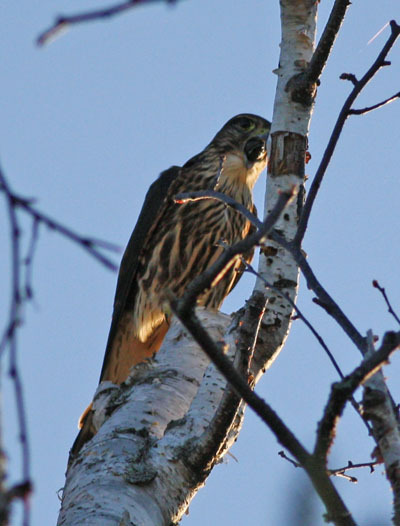 I’ve never even seen a Merlin in the wild. Amazing timing for you to witness this. Thanks for sharing. 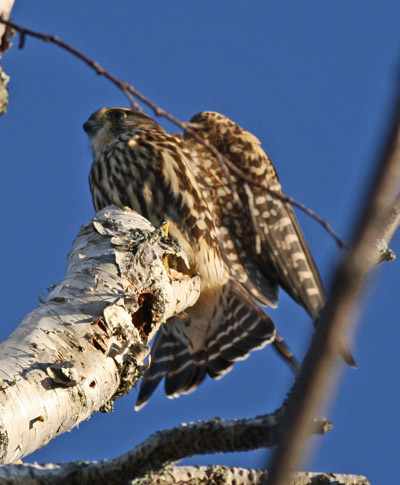 I just scrolled throught these pix yet again and noticed the bird is sitting in a birch snag. I have to say that up at Hasty Brook- all of my best bird sightings have been in a birch snag. After our fire last year the DNR firmly “suggested” we remove the birch snags because of the fire hazzard. We have yet to do it. It’s my favorite bird perch! I’ve never seen a bird cast a pellet nor have I ever found a pellet on the ground. I looked for this one, but I couldn’t find it. Reminds me why I quit smoking! Great photos – great commentary! What a beautiful bird, even when it finds the woodpeckers tasty! Wow! what a great series of images. I’ve found and picked through owl pellets, but have never seen one from any other bird. 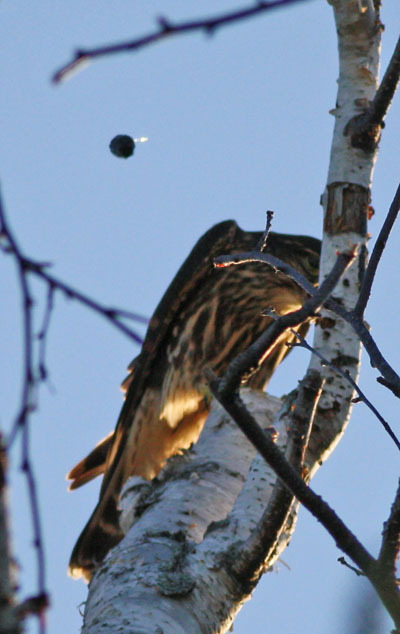 And have never been lucky enough to see a bird throwing one, much less have my camera ready. Thank you for sharing! !